Abstract The scale of the decarbonisation challenge to meet the Paris Agreement is underplayed in the public arena. It will require precipitous emissions reductions within 40 years and a new carbon sink on the scale of the ocean sink. Even then, the world is extremely likely to overshoot. A catastrophic failure of policy, for example, waiting another decade for transformative policy and full commitments to fossil-free economies, will have irreversible and deleterious repercussions for humanity’s remaining time on Earth. Only a global zero carbon roadmap will put the world on a course to phase-out greenhouse gas emissions and create the essential carbon sinks for Earth-system stability, without which, world prosperity is not possible. The Paris Agreement (PA) forged by 195 nations is historic. The global consensus to limit temperature rise to under 2∘C, and the ambition “to pursue efforts to limit the temperature increase to 1.5∘C above pre-industrial” is fully aligned with climate research [Schellnhuber et al., 2009; Intergovernmental Panel on Climate Change AR5, 2013; United Nations Framework Convention on Climate Change, 2015a, 2015b, 2015c] and the scientific assessment of a safe operating space for humanity [Rockstr.m et al., 2009; Steffen et al., 2015]. But there is a worrying lack of clarity in how to achieve this. While the overall goal is relatively clear on reaching net-zero emissions by mid-century (Article 4.1 on balancing anthropogenic emissions by sources and removal by sinks by second half of this century) the agreement is void of quantitative emission pathways to reach this goal, and bizarrely, the phrase “fossil fuels” is never used. The scientific assessment shows that realistically, nations will bust the remaining carbon budget. The resilience of natural carbon sinks is deteriorating, and some key biomes, such as rainforests, may cross tipping points to becoming sources of carbon. Keeping well below 2∘C will require creating a new carbon sink on the scale of the natural ocean sink. In reality, despite the progress of the PA, nations are gambling with the stability of the Earth system. We urgently need an international zero carbon roadmap, which translates the ultimate goal of the PA (net-zero emissions by 2050 and all efforts to stabilize global mean temperature well below 2∘C aiming at 1.5∘C) to national and sector-by-sector transformation pathways to a zero-carbon world economy. Locking world development to a zero carbon roadmap, aligned with the best climate science, will force action from policy, business, and societies, and potentially provide a self-amplifying journey of disruptive innovations and societal change. The PA is a novel step in governance of planetary change, away fromthe old logic of a global legally binding top-down treaty. Instead a hybrid model has emerged, combining international legally binding top-down elements, like the Paris cordon sanitaire confining global warming (at well below 2∘C), and the obligation of all countries to make nationally determined contributions (NDC), with a polycentric bottom-up approach. Most notably that there is no regulation of how ambitious the NDCs need to be (no national emission reduction targets) and there is no international compliance mechanism to hold countries accountable. If delivered, the contributions that are currently on the tablewould lead to planetary warming of an estimated 2.9–3.4∘C by 2100 [Rogelj et al., 2016] (with a 66 % probability level)—a dangerous gap between ambition and commitment. The hybrid make-up of the PA is the result of pragmatic political design: the outcome of a long-winded compromise process in our sub-optimal pre-Anthropocene governance regimes.Nations must still navigate their course through potential inconsistencies between the binding top-down and the self-determined bottom-up features of the Paris pact. The potential link between ambition and realpolitik is the agreement’s 5-year review and ratchet mechanism to encourage parties to commit to deeper emissions cuts. Will this work? Possibly—global emissions are showing early signs of stalling due to recent policy interventions, technological innovations and perhaps also shifting consumption patterns. However, it is too early to confidently suggest a peak is imminent. The Earth system is governed by biogeophysical nonnegotiable processes that must be respected regardless of legal frameworks [Steffen et al., 2004; Rockstr.met al., 2009; Knutti et al., 2016]. Limiting global surface temperature increase to 1.5∘C (at least by 2100) with a more than 50% chance of success will require three challenges to be met, namely (i) rapid and deep decarbonization; (ii) negative carbon emissions in the medium term; and (iii) enhancing biosphere resilience. In the following, we will articulate what is missing from the PA. In addition, we identify crucial research topics that need to be addressed for managing the risks arising from a possible failure of the Paris approach. Aim to keep global warming as far below 2∘C as possible. Restrict cumulative carbon dioxide emissions to an overall carbon budget of less than one trillion tons after 2011, with net negative carbon emissions from 2050 onwards winding the cumulative emissions back well below one trillion tonnes of CO2. Phase-out greenhouse gases completely by 2050 or shortly thereafter, through political measures such as carbon pricing and abolition of fossil-fuel subsidies. An equitable sharing of the remaining global carbon budget, with developed nations decarbonizing well before 2050. Stimulate a wave of innovations, with a special emphasis on energy systems, transportation, and land use. Develop a global strategy to reduce vulnerability and build resilience to deal with loss and damage. Safeguard carbon sinks in the biosphere by maintaining ecosystems and critical biomes. Finally, secure $100 billion USD per annum in climate finance for developing countries. The December 9 (2015) draft of the PA included options that went a long way toward meeting all but one of the Earth Statement requirements, missing only the explicit inclusion of a carbon budget. In fact, the draft text included formulations such as “peaking of global greenhouse gas emissions as soon as possible [and]…rapid reductions thereafter to 70–95 per cent below 2010 levels by 2050; toward achieving net-zero greenhouse gas emissions after the middle of the century informed by best available science.” Unfortunately, the following day, all options in this paragraph had been removed and the agreed text failed to quantify the targeted level of emission reductions by 2050. Moreover, it introduced ambiguous new jargon: Parties would aim “towards reaching greenhouse gas emissions neutrality in the second half of the century.” The final draft (December 12) revisited this crucial clause and provided again more clarity: “Parties aim to… achieve a balance between anthropogenic emissions by sources and removals by sinks of greenhouse gases in the second half of this century.” It also replaced quantitative emission targets until 2050 with a commitment to follow emission reduction pathway “in accordance with best available science.” An acceptable compromise, which places continued high responsibility in science. The reality is that limiting warming to well below2∘C, or even to 1.5∘C, requires global emissions to peak by 2020 and a full decarbonisation of the world’s economy by 2040–2060, with net negative emissions in the second half of this century [Rogelj, 2015a, 2015b] (Figure 1). Developed nations must act to remove their dependency on fossil fuels as soon as possible, while developing nations must avoid becoming dependent on them while transforming to industrialized and prosperous societies. The agreement sets a global target to reduce all greenhouse gases. Indeed, CO2 emission reductions are imperative, but this achievement alone will not deliver on either 1.5 or 2∘C. All climate forcers need to be tackled aggressively: CO2 to stop temperatures from rising and limit long-term warming beyond this century, and short-lived climate forcers (SLCF), including methane, nitrate, black carbon, hydroflourocarbons, particulates, and aerosols to limit near-term warming. Reducing SLCFs could avoid up to 0.6∘C warming by mid-century [Rogelj et al., 2014; Victor et al., 2015]. 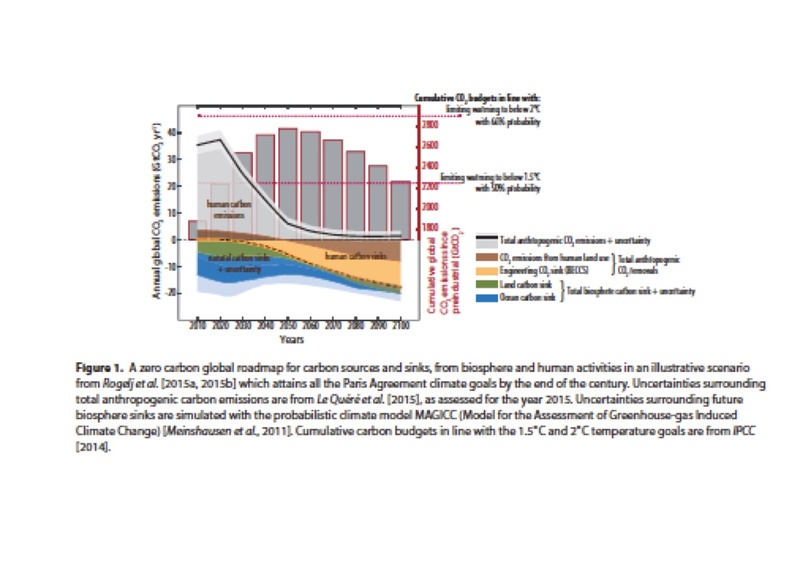 This is about half of the projected CO2 warming until then [Rogelj et al., 2014]. The transformation to a 1.5∘C and well-below 2∘C world can only be achieved by rapid reductions of both SLCF and CO2 emissions, and safeguarding biosphere resilience of carbon and methane sinks, over the coming decades, reducing the high risk of temperature overshoot that can trigger self-reinforcing positive feedbacks that amplify temperature rise. At the same time, the cooling effect of some SLCF (SOx, NOx)may offset parts of the benefits. For some non-CO2 greenhouse gases, e.g., those linked to agricultural practices, no currently viable mitigation strategies exist [Smith et al., 2014]. The agreement’s call for attaining a “balance between anthropogenic emissions by sources and removals by sinks of greenhouse gases” implicitly solicits net negative CO2 emissions in the second half of this century. Following the UNFCCC language and from a scientific point of view, this can only mean that Green House Gas (GHG) emissions from anthropogenic sources persisting beyond 2050 will be balanced by direct, anthropogenically induced, i.e., newly created carbon dioxide sinks in addition to existing natural sinks. Thus, net anthropogenic carbon dioxide emissions will need to be negative in order to compensate for remaining emissions such as residual CH4 and N2O emissions from agriculture. It is of equal importance to safeguard natural sinks in the biosphere to allow CO2 concentrations to fall again in the long-term and hence to provide Earth conditions for stabilizing temperatures at a lower level (although unavoidably, sea levels will continue rising and ocean acidification will persist). Today, roughly 20 billion tons of CO2, i.e., more than half of global anthropogenic carbon emissions, are annually sequestered by natural ecosystems on land and in oceans. This massive planetary sink is well integrated into the global climate analyses that assess mitigation pathways and global warming outcome scenarios. It is of critical importance that the PA is not interpreted to mean that those parties with large natural carbon sinks are entitled to emit more. If the agreementwould be interpreted in such away, the chances of remaining within a carbon budget consistent with 2∘C would become negligible. This is reinforced by the rising scientific evidence that biosphere resilience on land and in the ocean is rather uncertain and potentially even deteriorating. This may lead to a gradual loss of land carbon sinks, and in the medium-term future even to the transgression of tipping points, where carbon sinks (like tropical rainforests) abruptly turn into carbon sources [Brienen et al., 2015]. Also the oceans are likely to become a considerably weaker carbon sink, possibly even a source of CO2 as atmospheric CO2 concentrations are lowered by emission reductions in combination with anthropogenic carbon sinks. Both 2∘C and1.5∘C targets will almost surely require implementing negative emissions technologies (NETs) for carbon dioxide [Intergovernmental Panel on Climate Change, 2014; Rogelj et al., 2015a, 2015b;Williamson, 2016] to achieve a global balance between sinks and sources of greenhouse gases. NETs might include schemes for air capture and geological sequestration of CO2 but neither the effectiveness nor the safety of those technologies has been proven so far. Therefore, we will focus here on conventional carbon capture and storage (CCS), bioenergy with carbon capture and storage (BECCS), and biosphere carbon uptake through sustainable land management practices [Obersteiner, 2001; Smith et al., 2016]. Most recent scenarios from integrated assessment models assume deployment of NETs when attempting to limit warming to below 2∘C [IPCC, 2014]—even more so in the absence of strong emission reductions before 2020. But the feasibility of those measures at planetary scale is uncertain [Fuss et al., 2014; Smith et al., 2016). To put this into perspective, scenarios consistent with 2∘C rely on BECCS to deliver up to roughly 10 GtCO2 annually by the end of the century (i.e., about 25% of year-2010 CO2 emissions). Given the oceans currently remove about 10 GtCO2 the expectation is that anthropogenic BECCS can establish an additional carbon sink on the order of magnitude of the world’s oceans. Moreover, issues related to the large-scale production of biomass for energy are not just a problem of 1.5∘C and 2∘C scenarios. Scenarios that cross 3∘C rely on similar amounts of bioenergy in their energy mixes over the coming decades. The main difference is only that not all carbon dioxide from biomass combustion is captured in the latter scenarios. Scenarios also identify future pathways that rely significantly less on negative emissions and BECCS. These pathways require precipitous emission reductions in the coming decades and high energy-efficiency improvements that limit energy demand. Keeping warming below 1.5∘C without exceeding that limit translates to a global carbon budget of approximately 550–600 GtCO2 from 2011 [IPCC, 2014]. With current global annual carbon emissions of approximately 40 GtCO2/year [2014–2015, and a global carbon budget of some 400 GtCO2 remaining to be emitted, gives us about 10 more years of global emissions at current pace. Only an induced implosion of the fossil fuelled business as usual through disruptive changes in investment dynamics, technology, and consumer behavior could move those scenarios closer to reality [Rockstr.m, 2015; Schellnhuber et al., 2016]. However, mitigation action has been slow to materialize so far. Therefore, we must consider the serious possibility that an additional 1000 GtCO2 will enter the atmosphere in the coming decades, resulting in a significant overshoot of the budgets in line with the 1.5 and well-below 2∘C targets agreed in Paris. This is humanity’s biggest gamble. Given the intricacies and nonlinearities of the Earth-system processes involved, nations would be unwise to take for granted the robustness of the biosphere’s capacity to buffer anthropogenic interferences. Carbon-cycle feedbacks may lead to long-term reservoir failure. For instance, the boreal permafrost areas may release huge amounts of carbon to the atmosphere in response to rapid surface warming, thereby necessitating even greater levels of BECCS. Moreover, natural biosphere functionalities have been eroded by many decades of global-scale anthropogenic pressure related to land-use change, biodiversity loss and pollution [Rockstr.met al., 2009; Steffen et al., 2015]. Therefore, the restoration of ecosystemand large biome resilience must be on top of the agenda in the immediate future to ensure that critical sub-components of the Earth system continue to provide the services we take for granted. This will especially require upscaling research to provide essential information on the behavior of natural carbon sinks. In parallel to the urgent scientific need to assess long-term pathways below 2∘C, three sets of complex unanswered scientific questions arise fromthe Earth systeminterplay with the climate systemin regulating planetary climate. Is it possible at all to keep global warming below 2∘C, given the behavior of natural carbon sources and sinks that are also directly disturbed by human interference (such as land-use change)? And vice-versa, what sustainable transformations in ecosystem management—from cities to agriculture and preserving biodiversity—are necessary to stand a chance of reaching a below 2∘C future? And given the high risk of global temperature overshoot;What type of global temperature excursions makes overshooting a no-return trip? Will an episodic breach of the temperature limit shift certain biogeophysical feedback loops from negative (dampening) to positive (self-reinforcing) operation? In particular, for how long and at what greenhouse gas levels can overshoot occur without activating major tipping elements [Lenton et al., 2008] and how far can sustainable management of marine and land-based ecosystems go to allow overshoot without triggering positive biosphere feedbacks (and conversely, what role does loss of biosphere resilience play in lowering amplitude of allowed overshoot? ), and what role can a rapid reduction of SLCFs play in lowering the amplitude of overshoot that would otherwise trigger positive feedbacks from [the] biosphere? And, finally, even if temperature goals are achieved, what irreversible changes in the Earth system may be triggered nevertheless? Is there any way to successfully remediate overshooting by developing and deploying sustainable strategies, practices, and technologies? We propose the establishment of a global zero carbon roadmap to put the international research community and technology sector on an accelerating trajectory to permanently bend the global curve of anthropogenic emissions by 2020 and reach a decarbonised world economy by mid-century or soon thereafter, reviewed and republished every 2 years to remain on the trajectory and incorporating policy instruments and behavioral change. In parallel,we need immediate scientific clarity onwhether a 1.5–2∘C climate future requires (i) the complete phasing-out of fossil-fuel emissions by 2040–2060; (ii) an unprecedented anthropogenic expansion of biosphere carbon uptake through afforestation and “carbon-farming” with potential impacts on food security and freshwater availability; (iii) reliance on CCS and BECCS, or an adequate combination of both; and (iv) complete avoidance of temporary overshooting. Establishing such a roadmap requires that the political accomplishment of stepping up to the planetary climate challenge at the Paris COP21—with a universal and (as intended) legally binding agreement for transformative global climate action, is permanently translated to a global regulatory framework, executed by political decision making entities at all scales andmandated through global governance by the planetary boundary conditions set by a global zero carbon roadmap. This strengthened global governance should be consolidated by an alliance of multiple stakeholders, including academia, the private sector, and civil society. Our conclusion is that the design and implementation of a global zero carbon roadmap is an immediate necessity to stand a chance of avoiding the risk of global temperatures overshooting the planetary limit of 2∘C set in Paris. The planetary urgency is further justified by the fact that the critical precondition for even standing a chance of holding the Paris lines is whether we are able to safeguard the natural carbon sinks in the oceans and on land. We need both a fossil-fuel free world economy and biosphere resilience to succeed. Each day without a zero carbon roadmap increases the stakes in our global climate gamble. Brienen, R. J.W., et al. (2015), Long-term decline of the amazon carbon sink, Nature, 519(7543), 344–348, doi:10.1038/nature14283. Fuss, S., et al. (2014), Betting on negative emissions, Nat. Clim. Change, 4(10), 850–853, doi:10.1038/nclimate2392. to the Fifth Assessment Report of the Intergovernmental Panel on Climate Climate Change, edited by CoreWriting Team, R. K Pachauri, L. A. Le Qu.r., C., et al. (2015), Global Carbon Budget 2015, Earth Syst. Sci. Data, 7, 349–396, doi:10.5194/essd-7-349-20154. system, Proc. Natl. Acad. Sci. U. S. A., 105, 1786–1793, doi:10.1073/pnas.0705414105. model, MAGICC6 – Part 1: Model description and calibration, Atmos. Chem. Phys., 11(4), 1417–1456, doi:10.5194/acp-11-1417-2011. Obersteiner, M. (2001), Managing climate risk, Science, 294(5543), 786–787, doi:10.1126/science.294.5543.786b. Rockstr.m, J. (2015), A ‘perfect’ agreement in Paris is not essential, Nature, 527(2015), 411, doi:10.1038/527411a. Rockstr.m, J., et al. (2009), A safe operating space for humanity, Nature, 461(7263), 472–475, doi:10.1038/461472a. end-of-century warming to below 1.5∘C, Nat. Clim. Change, 5(6), 519–527, doi:10.1038/nclimate2572. goals for climate protection, Environ. Res. Lett., 10(10), 105007, doi:10.1088/1748-9326/10/10/105007. Agreement climate proposals need a boost to keep warming well below 2∘C, Nat. Clim. Change, 534, 631–639. Schellnhuber, H. J., et al. (2009), Solving the Climate Dilemma: The Budget Approach.WBGU Special Report, WBGU, Berlin. Smith, P., et al. (2014), Agriculture, Forestry and Other Land Use (AFOLU), in Climate Change 2014:Mitigation of Climate Change. Contribution ofWorking Group III to the Fifth Assessment Report of the Intergovernmental Panel on Climate Change, edited by O.
Edenhofer et al. , pp. 811–922 , Cambridge Univ. Press, Cambridge, U. K.; New York. 2013–2015 Review , pp. 1–182 , UNFCCC, Bonn,Germany. (UNFCCC, 2015) Draft (9 December 2015). Williamson, P. (2016), Scrutinize CO2 removal methods, Nature, 530, 153–155, doi:10.1038/530153a. is non-commercial and no modifications or adaptations are made. Cite: Rockström, Johan, Hans Joachim Schellnhuber, Brian Hoskins, Veerabhadran Ramanathan, Peter Schlosser, Guy Pierre Brasseur, Owen Gaffney et al. “The world’s biggest gamble.” Earth’s Future 4, no. 10 (2016): 465-470.